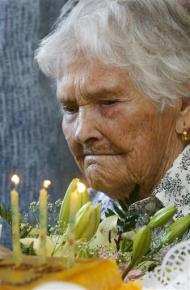 In this Sept. 10, 2006 file photo Maria de Jesus, looks at the candles on her birthday cake as she celebrated her one hundred and thirteen year borthday in Corujo, Portugal, 150km north of Lisbon. A woman who lived to see five of her great-great grandchildren born and was believed to have been the world's oldest person living, has died in northwest Portugal at the age of 115, officials said Friday Jan. 2, 2009. De Jesus, who lived to reach 115 years and 114 days and was listed by the Guinness Book of World Records and the Gerontology Research Group as the world's oldest person, died in an ambulance near the town of Tomar. 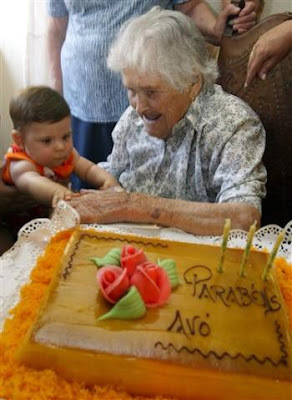 A Portuguese woman who lived to see five of her great-great grandchildren born and was believed to have been the world's oldest person died on Friday at the age of 115, officials said. Maria de Jesus died in an ambulance near the central Portuguese town of Tomar, town council officials said. She had been listed by the Guinness Book of World Records as the world's oldest person. That title now falls to an American, 114-year-old Gertrude Baines, who lives in a Los Angeles nursing home. Born Sept. 10, 1893, de Jesus was widowed at 57, outlived three of her six children, had 11 grandchildren and 16 great-grandchildren. On Friday, she ate breakfast normally, but then was taken to hospital because of a swelling, her daughter Maria Madalena told state news agency Lusa, without elaborating. De Jesus was 115 years and 114 days old. "I regret the death of this lady, she really was the sweetest person," town councilor Ivo Santos said in Tomar, central Portugal, 135 kilometers (84 miles) north of Lisbon. There are now only 82 women and nine men verified as being 110 or older, according to gerontologist Dr. Stephen Coles of the Gerontology Research Group at the University of California, Los Angeles. But he said there could be hundreds more in places such as China, India or Africa where they would not have caught the attention of the Gerontology Research Group, a small volunteer organization that tracks supercentenarians and verifies their birth dates through birth certificates and other documents. Coles said the supercentenarians appear to share one trait that might account for their longevity — they come from families whose members are long-lived. "Whether they drink alcohol or not, it doesn't matter. Whether they smoke cigarettes or not doesn't seem to matter," he said. "The thing that does seem to matter is that they chose their parents wisely." "It's in the genes. It's in the DNA," he said. Baines — the new titleholder, born in Georgia on April 6, 1894 — spent most of her life in Ohio, where she worked as a dormitory housekeeper at Ohio State University in Columbus, Coles said. Her only daughter died at age 18. Coles said he asked the staff at Western Convalescent Hospital to tell Baines she is now the oldest living documented person in the world. "She's very healthy. Her only complaint, as far as I can tell, is arthritis in her left knee," he said. She uses a wheelchair. He described her as mentally sharp, saying "she doesn't forget anything." Baines voted in the November presidential election, the Los Angeles Times reported. She voted for Barack Obama "'cause he's for the colored people," said Baines, who is black and the daughter of former slaves.